Atlantis submarine undersea Kona tours is one of the more unique things to do in Kona. 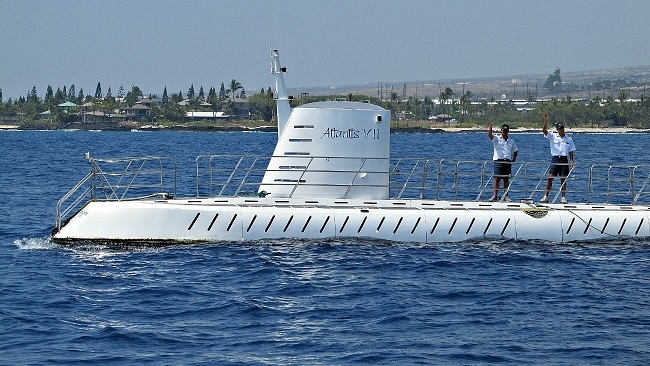 It's a fascinating and unusual way to view the undersea sights around Kailua Bay, particularly if you don't scuba dive. Having never been in an actual submarine ourselves, we were of course curious. That is probably reason enough to include this on your list of things to do in Kona. After all, how many places in the world allow you to actually travel inside a submarine? This tour is especially fun for families with children (participants need to be at least 36in/91cm tall) or couples. The staff is friendly and knowledgeable, and really showed us a good time during our undersea excursion. Guests are transported from the Kona Pier on a shuttle boat, then board through the top of the sub. There's a steep ladder when entering the submarine, so passengers need to be physically capable of climbing down and up a ladder. Tour guides are eager to identify what you are seeing, and try to keep things interesting by maneuvering the sub to areas of activity. If it's full, the Atlantis II can accommodate 48 guests, and each seat has its own viewing portal. The sub was less than half full when we went, which allowed for plenty of elbow room and easy viewing. 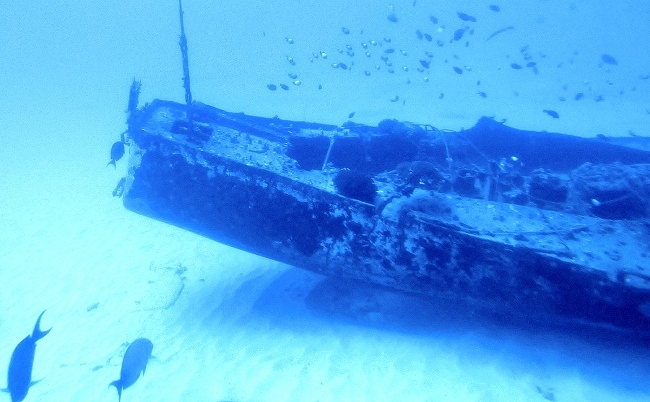 Book a tour aboard Atlantis Submarine today! As we began to descend, there was a certain sense of weightlessness as the submarine started floating slowly beneath the ocean surface. The water was a bit cloudy on this particular day so visibility wasn't great, but there were still plenty of interesting things to see. What you are able to see on the tour depends to a certain degree on what the ocean provides. Some days are murkier than others, some days you'll see more fish than others, or on rare occasions even a shark. There is always lots of coral, and we cruised past a couple of sunken wrecks and saw a few fish that we don't typically see when snorkeling. Our craft descended to a depth just over 100 feet (30 meters) below the ocean surface. Thirty minutes later the submarine returns to the surface and you are escorted back to the pier, with plenty of time to spend the afternoon finding other fun things to do in Kona! This tour fills early so it's a good idea to book in advance. Book a tour aboard Atlantis today!